“Together we thrive" is also the name of HSBC's new sound identity, sounds that respond to the last bank campaign unveiled last summer (signed Saatchi & Saatchi and Turner Duckworth). Jean-Michel Jarre, comprising seven distinct pieces created to adapt to the brand's 66 markets.The new sound identity will be heard by HSBC customers contacting call centers located in Canada, China, Hong Kong, in the UK, France, Mexico, Singapore, Malaysia, Indonesia, Bermuda, and the US As part of its deployment, "Together we thrive" will appear in marketing campaigns, at events sporting organizations (including 7-Rugby global sponsoring), agencies, banking and ATM applications, as well as global offices. Andrea Newman, World Brand Director, explains in a common "In a world where our audience is busy and distracted, sound is an increasingly important part of building a brand. Having a distinctive sound that goes hand in hand with our visual identity and logo makes it easy to recognize, no matter where and under what conditions our customers interact with us. "HSBC's collaboration with Jean-Michel Jarre was conceived and realized by the international music marketing agency My Love Affair. So he composed 7 pieces for HSBC? Delighted to announce that I have composed HSBC's full sound identity from the sound signature to a long musical piece composed of 7 edits called “Together WeThrive”. There's a proper twelve-and-a-half minute track in there. I hope we'll get a proper release of this. The Mindfulness edit reminds me a little of WFC, very beautiful. Oh yeah, that one definitely sounds like a continuation to WfC. Bravo for the project, especially for Mindfulness! Jarre has succeeded to compose such great ambient (and -like) music over the last few years! possibly some of the 75min WFC unreleased layered depth textures supplementing current excursions. The collaboration between HSBC and Jean-Michel Jarre is pored over in this week's Sync Story. Musician Jean-Michel Jarre is the composer of the new HSBC’s sound identity, marking the next phase of the company’s global brand refresh. Jean-Michel Jarre has produced seven pieces of music for use by HSBC, including for call-‘hold’ on its phone services. This collaboration was born following an initiative of My Love Affair. This music marketing agency based in London and founded by David Guetta and his former wife Cathy specialized in product placement in music videos. She also finds renowned musicians to become ambassadors of big brands like Will.i.am and Nescafé or Martin Solveig and Kia . It also organizes private concerts for companies. In July, Disneyland Paris will ask for the third consecutive year to plan an electronic music festival to appeal to 18-25 years of age who come less and less in the amusement park. My Love Affair wanted for several months to diversify in the creation of sound identity. It is by contacting major groups based in Britain that its leaders have woven their first links with HSBC. "We thought it was important that we find someone known and we identified four or five names," says Raphael Aflalo , the general director and co-founder of the agency and friend of Guetta " Jean-Michel Jarre quickly appeared to us as the ideal talent because its statutory and iconic status is perfect for a bank, and its renown in Asia as well as its companion who is a great Chinese actress was perfectly suited to an institution that is very present on this continent. The boss My Love Affair, who met two years earlier the composer of "Oxygene" and "Equinoxe" thanks to David Guetta, made him a collaboration offer in June 2018. "It was a bet because Jean- Michel had never agreed to work for a brand before but he immediately said yes, "admits Raphael Aflalo " He had just finished his new album and had free time in August. The idea at the beginning was to compose a jingle of two or three seconds but this project quickly gained momentum ". The artist-composer has indeed chosen to use the same melody to create seven distinct thematic pieces in order to adapt to the 66 markets in which HSBC operates. The shortest mood is 57 seconds and the longest is 12 minutes and 36 seconds long. There is one version for airports, another for stadiums and another one more suited to the Asian public. "In a world where our audience is busy and distracted, sound is an increasingly important part of building a brand," says Andrea Newman , HSBC's Global Brand Director. " Having a distinctive sound that's going to in combination with our visual identity and logo, we are easily recognized wherever and whenever our customers interact with us. 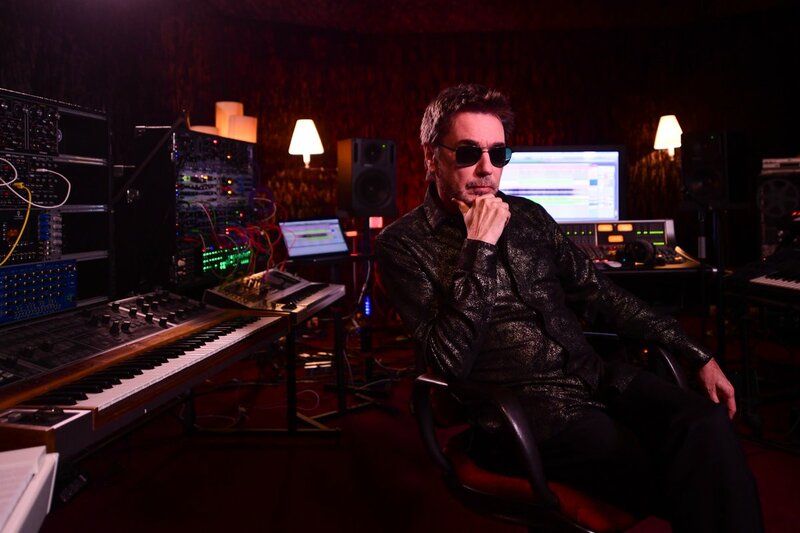 We are delighted to have partnered with Jean-Michel Jarre, who has created a sound identity that will work in the many countries in which we operate." This partnership with the pioneer of electronic music who has sold more than 80 million records worldwide should not stop there. " We asked him to compose small sounds that we can hear by clicking on HSBC applications or by withdrawing money from his vending machines," reveals Raphael Aflalo "It will be one and only note and there will be ten separate signatures".